In 2002, I was a (lay) campus minister at the St. Thomas More Center at the University of South Carolina, in year two of what would be a nearly five year long stint there. The Holy Father, that is St. John Paul II, was coming to North America for World Youth Day. There were no plans from STM to go to WYD. The Diocese of Charleston's Youth Ministry office had organized something, but it was well beyond the budget of a layman in the Church's employ! On Day 1, we got early to the fairgrounds where the Pope would make his first scheduled appearance at the opening Vespers. We wandered around, and then parked ourselves against a chainlink fence. A little later, much to my surprise, I heard my name being yelled. On the other side of the fence, a little distance away, there was another fence, and on the other side of that, a large group from upstate South Carolina. Two of our students from STM recognized me and were yelling and waving. Small Catholic world! We didn't realize it at first, but that fence marked out the path of the papal motorcade. When we realized it, we hugged the fence, and guarded our position fiercely, as the crowds around and behind us grew. I recall that electrifying moment when the Popemobile approached -- first the motorcycles with police, the the Secret Service (or whatever they call them in Canada), and then the white vehicle. There were screams and yells, and everyone pushed against the fence. The Holy Father was looking away from us, but I got a few good photos and a great video clip. My heart filled with so much emotion, so much love! I loved this man, even though I had never met him. He represented the very center of the Church, a visible icon of Jesus Christ! I screamed at the top of my lungs and joined in the chants of "Viva il Papa" and "JP2 we love you!" I will never forget that. There were other highlights as well. The giant closing Mass at an abandoned airfield outside Toronto, and walking miles and miles (sorry kilometeres and kilometers) to get there. Meeting up with a group from Carl's parish in Marietta (St. Ann's) and camping next to them overnight. It rained at night, and it was miserable, and water trickled through the tent, and the circle dances and music and drums and festivities went on all night. The porter-potties in the morning were truly horrendous. It continued storming through the morning, and then the Papal helicopter arrived, and the rain stopped and Mass began, and just as the Gospel was proclaimed (or perhaps it was when he started his homily), the clouds parted, and a ray of sunshine burst through and illuminated the stage. Holy Communion was truly amazing (even though, I tend to be a little skeptical of distributing Holy Communion widely at giant papal mega-Masses; the risk of sacrilege and profanation is just too high.) ... a lay extraordinary minister (or perhaps it was a religious sister) stood at one point, and, like spokes going to the center of a wheel, lines formed all around her, and she turned and communicated each person at the front of each line. The Communion chant was "Nada te Turbe" (the beautiful poem by St. Teresa of Avila, set to simple Taize chant), and it felt like I was in heaven, and I wept openly. That evening, hanging out with the group from St. Anne's at their hotel downtown, I spied a man lying on the sidewalk outside the lobby. It seemed like a homeless man, drunk. He wasn't very coherent. Then a, um, rather scantily clad lady approached and started talking to him. This lady-of-the-night knew him, and asked if I had some money for a cab fare for him. I went back in and we collected enough money, and then she called a taxi (I really don't recall if she had a cell phone or not!) and we put him in the cab and gave the cabbie the address. It was a strange little encounter, and, therefore, still in my memory. I've scoured all my old photos on my hard drive, and any physical albums I still have, but I cannot find a single photograph from this memorable event. 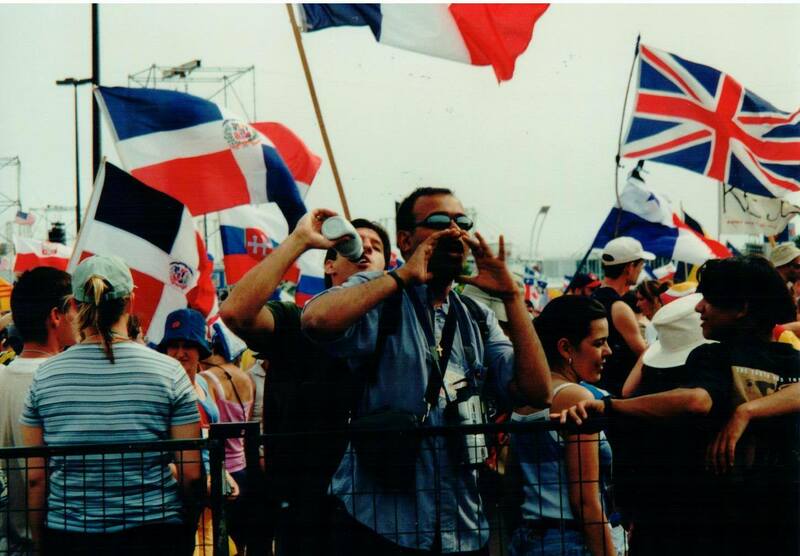 I have photos from 2001, but somehow, nothing from WYD. That video clip of JPII was on an analog video camera, with 8mm tapes. I have no idea where, in my many moves since then, it's gone. However, I'm still in touch with one of those two students I mentioned above. She's actually a pretty well known Catholic blogger, and she will be one of the presenters at the upcoming World Meeting of Families with Pope Francis this week. 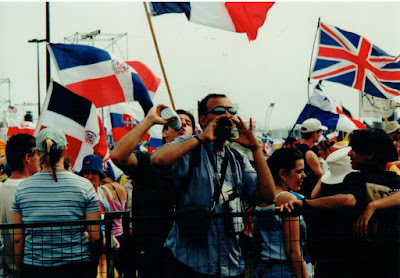 She just wrote a great blog about how to prepare to go to a Papal mass event (heh), and shared her experiences from WYD 2002. And she kindly sent me a photo she found as she was preparing to write that post. This is yours truly, yelling at their group, across the fence, in Toronto in 2002. Thanks Lacy! the same today as he did then, sonofagun! A visit from the Holy Father is a time of such grace. I look forward to our parish pilgrimage, some 108 people, actually from all across the Archdiocese, who will be going up to Philadelphia this coming weekend to encounter Francis, Bishop of Rome. 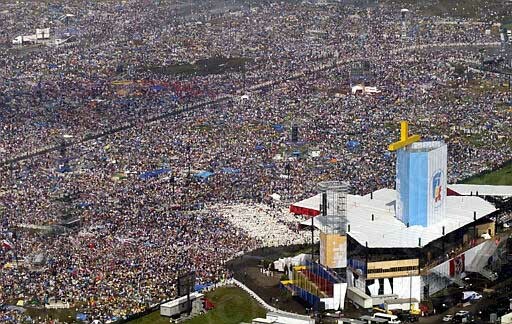 I have heard stories of how WYD in 1992 in Denver changed the lives of folks, and the same about WYD in 2002 and later. How will the Lord move us, through Pope Francis, in 2015? Get ready to be uncomfortable!